What a week I've just had. Without really planning to I've run 80km (50 miles) this week. I ran to work and back twice, took the dog for a run yesterday and today, copying the astronaut who ran the Boston Marathon on a treadmill in the International Space Station last week, I decided to run with the elite men in the London Marathon. Rather than sit and watch the London Marathon I set up a telly in front of my treadmill and set off running with the elite men. Strangely enough even though I was running at 8mph I managed to keep up with them. Magic! Two hours, and a staggering amount of sweat later, I'd run 16 miles. I was tempted to round it up to 20 but reckoned I'd done enough for one week (when compared to my usual 10-15 miles per week in the pre-Jungfrau days). I found it fairly comfortable and like to think I could have turned in a sub 3:20 marathon which is fine for the stage I'm at in my journey to the Jungfrau, especially considering I've just been back running for three weeks. Normally, 40 minutes is enough for me on the treadmill but this worked really well. It passed the time quickly and when the motorbike camera was facing forward the sensation of actually running with the marathoners was uncanny. I even joined them in the final sprint by upping my speed. I drank 750 ml while running but reckon I lost much more. I was dripping when I finished and the treadmill and one yard around it were swimming. Lots of drinks and fruit and high GI carbs seems to have done the trick as I feel fine now. So, all in all April has been a good month so far on the running front. It should give me a good base to start improving the speed and strength in May. Off to get the 7-day heart monitor fitted tomorrow. Labels: Boston Marathon, International Space Station, London marathon, treadmill. That's a brilliant idea! I have a tape of the New York Marathon 2004, when Paula Radcliffe won it, I might try this at home! 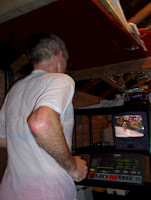 All we need now is to link the tv to the treadmill so it goes at the same speed as the runners. As if! I once ramped up my treadmill to the speed Paula runs and I couldn't maintain it for more than a few seconds. Unbelievable. Mick I can't even cycle as fast as she can run. Also (this is how dizzy I am, I don't have a treadmill!! Mick the deadline to pay entry fee for Jungfrau is Monday, in case you haven't already! Ha! A slight flaw in your plan if you don't have a treadmill. I don't suppose running on the spot is quite the same, not to mention the damage it would do to the living room carpet! Thanks for the warning about the entry fee deadline. To guarantee an entry I signed up for their offical training week in August so I'm hoping the deadline doesn't apply to me. I might just drop them an email to make sure.